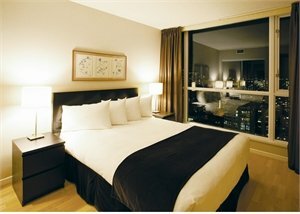 Ideally located in the heart of famous Robson Street, this 31-storey hotel offers the corporate and leisure traveler proximity to both the financial district and the entertainment center of Vancouver. Fashionable Robson Street offers shopping, sidewalk cafes, restaurants and more. NOTE: 5 May - 30 Sep 19 travel based on Sun-Thu rates. A surcharge will apply for stays that include Fri-Sat. Premium Date surcharges and/or blackouts may apply on selected travel dates. NOTE: Premium Date surcharges and/or blackouts may apply on selected travel dates. Maximum two people permitted in a Standard One Bedroom Suite. 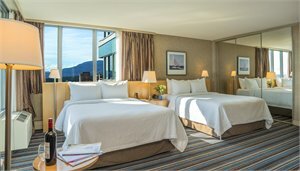 In the heart of the entertainment and sports district, the Rosedale on Robson Suite Hotel offers you comfort and relaxation, with water and mountain views, in a perfect central location. Choose from one and two bedroom suites with fully equipped galley kitchen. NOTE: Premium Date surcharges and/or blackouts may apply on selected travel dates. The Sheraton Wall Centre lies in the core of Vancouver surrounded by the boutiques of trendy Robson Street and Yaletown, outdoor markets, clubs, art galleries, and theatres, along with a wide variety of local and international dining choices. NOTE: Premium Date surcharges and/or blackouts may apply on selected travel dates. Maximum two people permitted in a Traditional King Room. 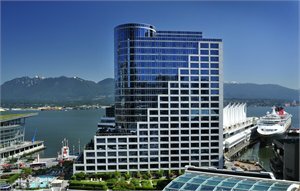 Experience the best that Vancouver has to offer, surrounded by panoramic views of the Coastal Mountains, Coal Harbour and city skyline. 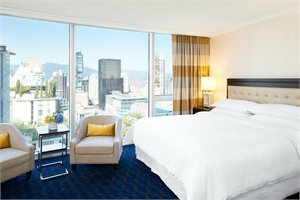 The Pan Pacific luxury Vancouver hotel, is situated on the downtown waterfront with some of the city’s top tourist attractions including Flyover Canada and Gastown, the Vancouver Convention Centre, Cruise Ship Terminal as well as popular shopping and entertainment districts just minutes away. 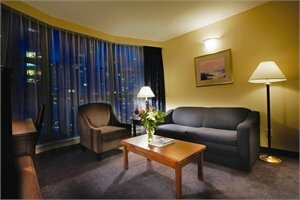 Centrally located in the heart of downtown Vancouver; only steps to GM Place, BC Place Stadium, the Vancouver Playhouse and Queen Elizabeth Theatre. Dine in one of the on-site restaurants and then unwind in the indoor pool and whirlpool. 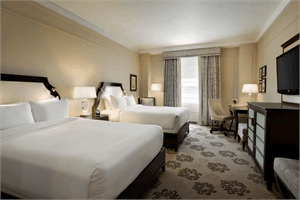 The Fairmont Hotel Vancouver is located in the heart of Vancouver’s cultural and entertainment districts. Featuring a spa, health club, award-winning restaurants and designer shops. 556 spacious guestrooms offer the services of a world-class hotel with the elegance of an English castle. 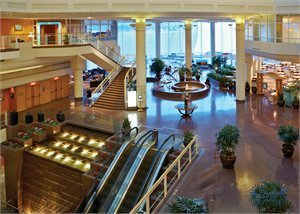 This luxurious waterfront hotel on the shores of Burrard Inlet is situated beside an enclosed walkway to the trade and convention centre and cruise terminal; and within walking distance to the central business district, Gastown, Robson Street and the Pacific Centre shopping mall. PACKAGE TERMS & CONDITIONS: It is our policy to present the cost of our holidays inclusive of all airport and government charges. Please accept however that these charges are not within our control, therefore we reserve the right to pass on any increase.. Travel agent professional service fees where charged, will be additional to the advertised prices. *Child prices are based on one or two children of 2-11 years sharing a twin room with 2 adults (varies by property and room type). Valid for sales to 30 Nov 2019. Valid for travel commenced and completed within the period 20 Jan 2019 to 15 Dec 2019 (unless otherwise specified). 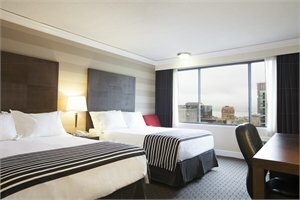 Min stay: 4 days Max stay: 28 Days.Prices are ex Auckland. For departures ex Wellington please add $159 per adult and add $119 per child. For departures ex Christchurch please add $159 per adult and add $119 per child. Book NZ "W" class international. Book NZ "H" class domestic within NZ. Important: Day of the Week Airfare Surcharge An additional airfare surcharge of $33 per person each way applies to travel AKL/YVR or YVR/AKL for travel on Friday, Saturday or Sunday. 21 Advance purchase required: Reservations for the first international flight must be made at least 21 days before departure - counting from the day of reservation but not counting the day of departure. Ticketing Deadline: Ticketing must be completed within 14 days of original reservation / PNR creation or 21 days before departure, whichever is earlier. Please note that any Airline generated ticketing time limit which is earlier will over-ride this. Routing : WLG/CHC-(NZ)-AKL-(NZ)-YVR and vv. Travel is permitted on direct flights only. Provincial NZ Add Ons available. Travel from GIS/HLZ/KKE/NPE/NPL/PMR/ROT/TRG/TUO/WAG/WRE for an additional $218 per person return. Travel from : BHE/DUD/NSN/ZQN for an additional $262 per person return. Travel from : HKK/IVC/TIU for an additional $294 per person return. Stopovers are permitted in Auckland in each direction for an additional $49 per stopover. Taxes have been calculated using direct flights. Capacity is strictly limited. Fare may not be available on all services or routing options. Travel is not permitted on NZ 1-21, 26-619, 700-1199, 1300-4999, 6300-7999, 9000-9999. Due to flight schedules, additional nights may be required over certain dates. Cancellation and amendment fees apply. Fare Basis: For travel: 20 Jan - 19 Jun & 15 Oct - 15 Dec- WLSVCAZ ('W' Class). For travel: 20 Jun - 14 Oct - WHSVCAZ ('W' Class). Wholesale airfare must be sold in conjunction with a minimum 4 nights land arrangements. Please note further accommodation premium date surcharges and/or blackouts may apply on select travel dates, or during special events such as conventions and tradefairs. Prices shown are based on per person costs in New Zealand Dollars, for payment by cash, cheque or eftpos only. Credit card sales not permitted unless Travel Agent acts as a merchant. Capacity limitations apply and may not be available on all services. Travel requiring an overnight stay in New Zealand will be at passengers own expense. Events beyond our control such as currency fluctuations and changes to the price of aviation fuel may result in prices variations . Strict cancellation fees apply. Packages are based on consecutive nights. For split stays please contact your travel consultant. For full terms and conditions and cancellation fees please contact your local travel agent for more information. FLYER CODE: NZ16JULYVRGO.